How Does El Niño Drive Snowfall in the U.S.? Meteorologist Chris Tomer's west-coast El Niño predictions for the 2015/2016 ski season. Chris Farley brought El Niño into the American lexicon in a 1997 Saturday Night Live skit, when he recited lines like, “El Niño is Spanish for… the Niño” (trust me, it’s funnier when he says it). But still, it seems most skiers and snowboarders don’t know much more about the weather phenomenon than that. An El Niño condition occurs on every few years, so you might as well get your facts straight. El Niño is the Peruvian name given to an abnormal warming of the oceans around Christmas time off the west coast of South America. Since this colloquial naming occurred, scientists have defined exactly what El Niño means to them: A warming of the ocean of more then 0.5 degrees Celsius (about one degree Fahrenheit) for three consecutive months in an area along the equator from the west coast of South America west toward the central Pacific Ocean. That’s a handful of a definition, so just think of it as a warming of the central Pacific Ocean. What Does El Niño Mean to Skiers? Skiers care about El Niño because a significant change in water temperature across a large area of the ocean affects weather patterns across the globe. Since the strength of El Niño peaks during the Northern Hemisphere’s fall, winter and early spring, El Niño’s effects on weather also peak during winter. Some of these include droughts across Australia, heavy rain over Peru and a change in the jet stream across North America, which influences the location of the heaviest snow. For the U.S., El Niño causes a more southerly storm track, which often brings higher than average snowfall to the southern third of the U.S. and less snow with warmer temperatures across the northern third of the U.S. This frequently means that Southern California, Arizona, New Mexico and sometimes southern Utah and Colorado can see increased snowfall in El Niño years. There can also be cooler-than normal weather across the southeastern U.S., which can help ski areas in Georgia, Alabama and North Carolina with their snowmaking. If things come together just right, some storms can track up the East Coast and bring good amounts of snow to eastern areas of the Mid-Atlantic and New England. Are El Niño’s Effects Predictable? El Niño always comes in slightly different shades. We usually see an El Niño every couple of years, but its strength changes each time and so does its effects on worldwide weather. El Niño is not the only climate phenomenon that can influence weather across the globe, so just looking at El Niño will rarely allow meteorologists to accurately predict snowfall for the season ahead. That said, keep an eye on what scientists are predicting for El Niño and remember that it often means more snow across the southern third of the U.S., but also remember that each snowstorm has a mind of its own and you’ll be far better served looking for snow on the five-day forecast than betting on a three to six-month snow forecast based on Chris Farley’s "the Niño." 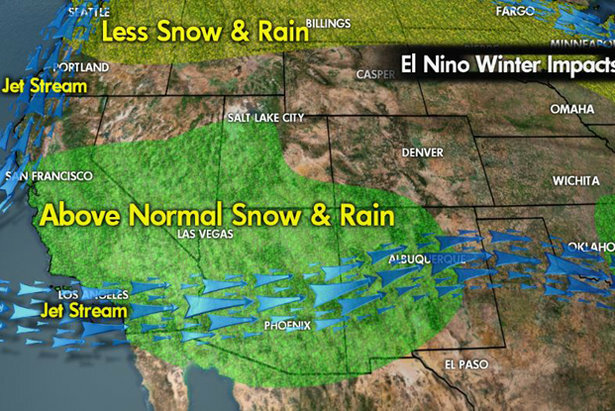 How Does La Niña Drive Snowfall in U.S.? Learn about La Niña, El Niño and a variety of methods used to predict the weather from Meteorologist Joel Gratz. Can It Snow When Temps Are Above Freezing? What Does a Perfect Snowflake Look Like? How Do Meteorologists Make Seasonal Forecasts? How Do You Use Radar to Find Snow? What's an Infrared Satellite Image? What's a Water Vapor Satellite Image? What's a SNOTEL Site and How's It Work?